With recent rain and a shortage of feed after a hot and dry summer, grazing oats is the perfect option to fill the feed gap, according to Pacific Seeds forage development lead Wayne Chesher. Mr. Chesher said autumn was the ideal time to introduce oats to the paddock. “Many areas received some useful falls recently and are now at a point where they may be looking to plant a forage crop to provide feed over autumn and winter,” he said. He pointed to economies of scale, geography and the crop’s ability to fatten animals due to high quality protein and energy as the major draw cards as to why farmers should consider planting forage oats. “Oats are fairly commonly grown in the western districts of Queensland and New South Wales as it is a lower input crop which offers a good body of feed and higher protein and energy levels. When native pastures are not at their best, this particular plant comes into its own in the colder months. He said Comet is a particularly popular variety due to its resistance to most strains of leaf rust and its ability to produce large quantities of high-quality autumn feed. Pacific Seeds’ third variety, Drover, is chosen by many growers due to its versatility across winter and spring. 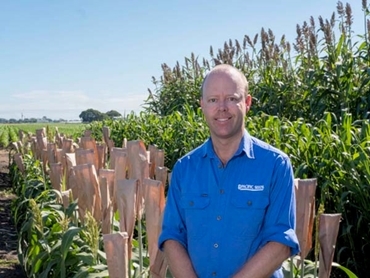 “Drover stays vegetative into spring often providing reliable feed until more traditional spring feed sources such as forage sorghum are able to be planted.